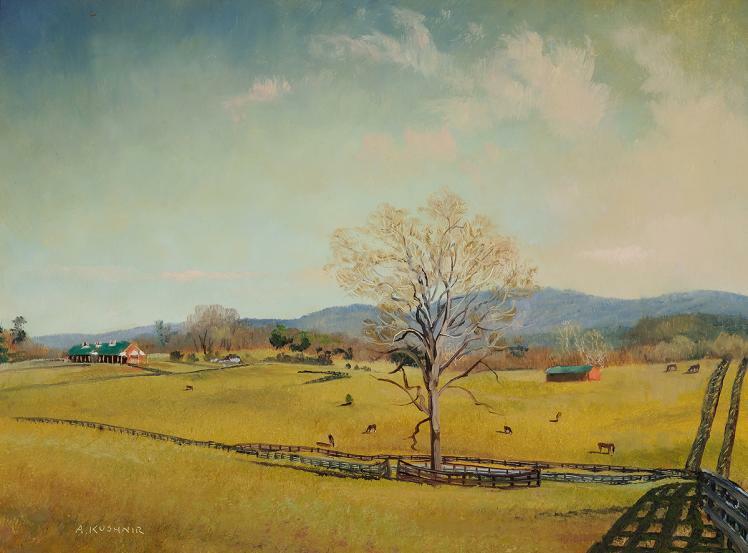 Washington D.C. artist Andrei Kushnir has recorded the history of the Shenandoah Valley through a series of paintings that capture the extraordinary beauty and vitality of the region, qualities that enticed pioneers to settle there and inspired artists to try to capture its vistas. The buildings and patterns of land distribution that are the substance of Kushnir's paintings provide tangible evidence of the Valley’s settlement and diversity, from communities and historic sites to farmlands and waterways. 52 of Kushnir's 263 painted landscapes of the Valley will be featured in this exhibition, with the entire body of his Valley landscapes pictured and described in the exhibition's companion catalog available for sale in our museum shop. Rediscover the Shenandoah Valley as a landscape of American diversity, settlement, and conflict. Explore how the story of our nation’s mixing of cultures remains spread across a spectacular natural setting. Discover how pioneers of English, German, Scots-Irish, French, and African descent moved into the Valley in waves of settlement and established a legacy of remarkably-varied religious beliefs. Learn about the lingering impacts of the Civil War. Plus, hear music by nationally-known Old Time Banjo artist Dan Gellert specifically created to accompany Kushnir's works. Painting the Valley: An Afternoon with Andrei Kushnir: gallery tour with the artist and book signing — Saturday, December 8, 2018. Learn more. For fellow cultural institutions interested in bringing Oh, Shenandoah to their facility, learn more about the traveling exhibition available in November 2019.